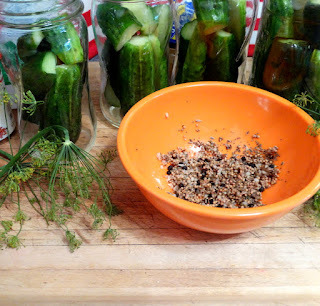 Once you make your own dill pickles, you'll wonder why you ever bought them at the grocery store! 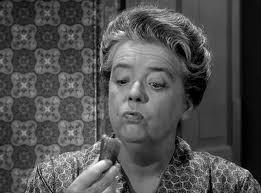 Aunt Bee is a wonderful cook, except that she can't seem to make a tasty pickle. No one wants to hurt her feelings and tell her that her homemade pickles are the worst ~ they taste like they float in kerosene. This puts into motion, 'operation pickle switch’: Andy, Barney, and Opie come up with the brilliant idea of substituting good store-bought pickles for her horrible homemade ones. 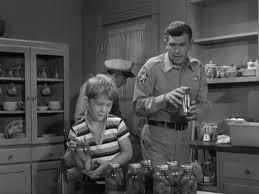 Opie, Barney & Andy in "operation pickle switch"
Naturally, Aunt Bee thinks these pickles are the best she’s ever made, and decides to enter them in the country fair. She's sure they’re worthy of a blue ribbon. Hearing this news, Andy and the guys know it would be unfair to the other contestants if Aunt Bee won. The only solution is for them to eat all 8 quarts of pickles before the contest, causing Aunt Bee to make another batch of her own for the contest. 26 billion pickles are packed each year in the U.S. That’s about 9 pounds of pickles per person. Amerigo Vespucci, for whom America is named, was a pickle merchant before becoming an explorer. In September 2000, when the Philadelphia Eagles thrashed the Dallas Cowboys in sweltering heat, the Eagles avoided cramping by guzzling pickle juice prior to and during the game. By the time the game was over, everyone agreed it had worked very well. It is now referred to as the “The Pickle Juice Game." “Pickle Polka” is the theme song of Pickle Packers International. Approximately 20% of pickles are sold refrigerated. Dill pickles are the most popular pickle. The phrase “in a pickle” was first introduced by Shakespeare in his play, The Tempest. The quote reads, “How cam’st thou in this pickle?” and “I have been in such a pickle." The noise that’s made when a pickle is bit into is called the “snap." A good snap can be heard from 25 feet away. Should you make these pickles, you'll hear the snap! Most importantly, use either Kirby or pickling cucumbers. They’re short and squat and make great crisp pickles. Begin with cutting the tip off the blossom end, or both ends of the cucumber, like I do. Slice them into strips or however you like them, and stuff them into sterile jars. Make the brine, chill it, and pour over the cucumbers, dividing equally. Seal well, refrigerate and let them set for at least a day before eating. These dill pickles are tasty with a great snap! 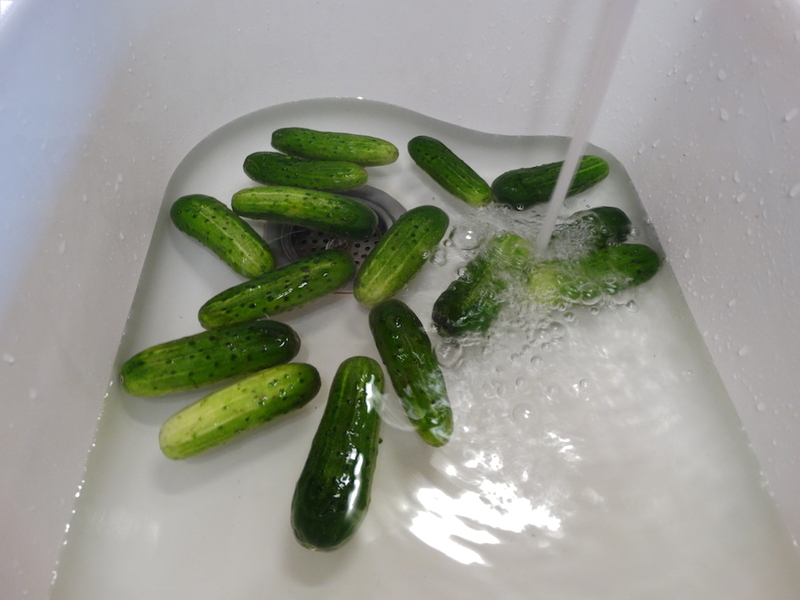 Wash cucumbers in cold water, slice into quarters, drain. Combine vinegar, salt and sugar in a stainless steel or teflon pan over high heat. Whisk until the salt and sugar is dissolved. Transfer to a large bowl and whisk in the cold water. Refrigerate brine until ready to use. Stuff the cucumbers into four or five 1-quart jars, add dill sprigs. Combine garlic, and spices in a small bowl. Divide the mixture equally among the jars. Fill jars with chilled brine; If necessary, add a a bit of cold water to the jars until the brine covers the cucumbers. Pickles will keep in the refrigerator for up to one month. 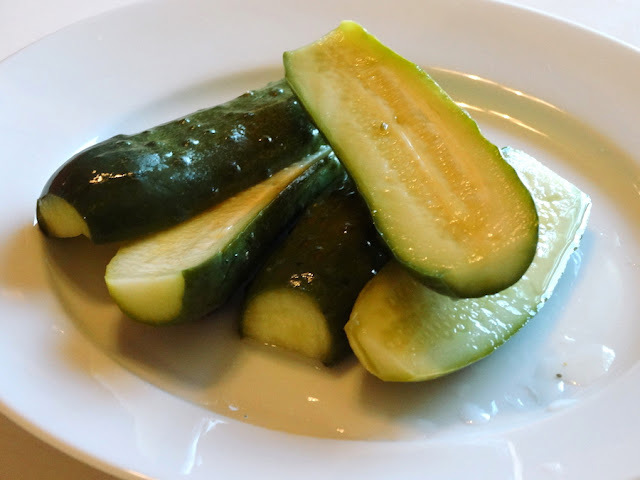 Fun story about Aunt Bee's pickles :-))Yours looks awesome, Pam. Loved the story about Aunt Bee, and love, love pickles. They are such a great addition to a main dish! True, I don't eat as much as in my younger days (salt, vinegar have a cumulative effect on our health), but I appreciate their being low in calories and boosting the good flora in our digestive system. Thanks, Duta! I love pickles too! Have a wonderful week! Loved all these pickle facts and the Aunty Bee story. 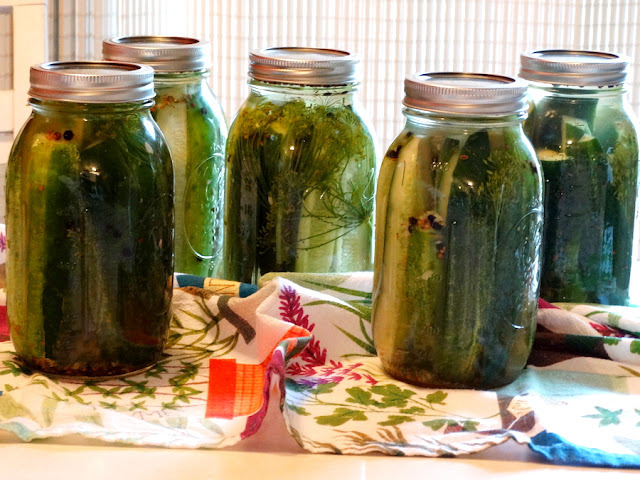 I have never even thought about making pickles - maybe a homemade pressie for Xmas? Hi Cakelaw! Perfect pressie for Xmas! Glad you liked it all. Thanks! OH gosh....they are beautiful. Nothing like having beautiful, great tasting pickles in your pantry. Cute pickle facts and I too really enjoyed the aunt Bee story. Garlic is no doubt the one crucial ingredient in pickles! Yours sound good, but I'm just too lazy to make my own. I remember the pickle barrel at a deli when I was a small child: so small that I think my nose was level with the delicious aroma coming from the top of the barrel. Thanks, natalia! Yes, we like homemade! I remember that pickle episode! Haven't thought about it in years, though. Fun stuff. And this is a great looking pickle. I love pickles, but almost never make them -- too impatient, too easy to buy. My loss, alas. I really need to try these -- they look excellent. Thanks! Hi Son! I hear ya'! I know there's never enough garlic for you and the same for red pepper. We'll see... Have a great rest of the week! I'll have to see if I can find that episode on Amazon :) I still love watching that show! Your refrigerator dill pickles sound wonderful and thanks for all of the interesting pickle facts! Thanks, Susan! I'm sure it's there and other places also like YouTube. Thanks for the visit and take care. Many summers ago, I went on a pickling craze and pickled everything (including grapes). I have NOT pickled anything this summer. Surely I can sneak in a jar of these! Thanks for the recipe! Hi Debra! These are so easy to make and so many different spices to add, I'd like red peppers in the mix too for a little hear. Thanks and take care. Perfect, our local market just got in pickling cukes and I've been looking for a good fridge dill pickle recipe. We don't have distilled white vinegar over here, instead we have Attika with is 24% acidity. I believe US white vinegar is around 5% so I'll just dilute accordingly. Hi Ron! Lucky you with the pickling cukes. You're right with the 5% vinegar. That's what I used for these pickles, versus Swedish. Good going! Thanks!